To Strip? Or Not to Strip? All things come to an end, including bottom paint. 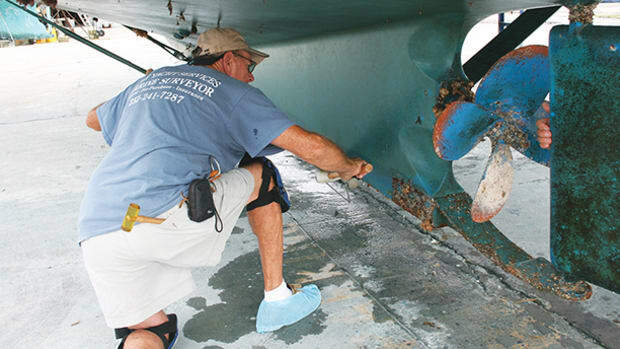 Here’s how to cope with antifouling separation anxiety. When she was young, your boat had a bottom that was as smooth as a babe’s, with not a dimple or a blemish. Your fingers slid across the surface like it was silk. But not anymore: Now her once-flawless gelcoat is hidden by layer upon layer of dead antifouling paint, like rouge on a dowager’s cheeks. Your boatyard manager says it’s time to strip her bottom and start fresh. It’ll make her slick as an eel, he says; she’ll go faster and burn less fuel. Heck, she’ll be like a kid again. Your checkbook quivers at the thought. Is such a thing really necessary? 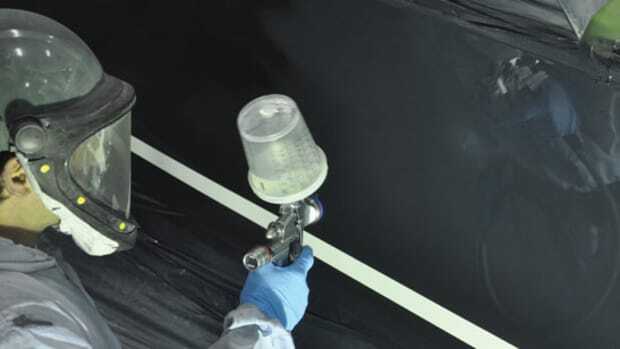 Nevertheless, virtually all antifouling paint will eventually fail. 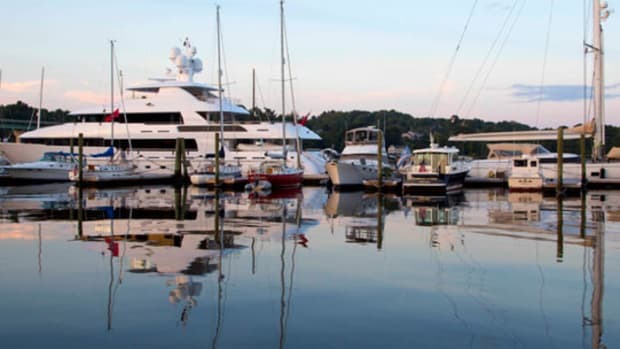 Jeremy Dolan, Technical Service Representative for International Paint LLC, manufacturer of Interlux products (www.yachtpaint.com), said that over many seasons and many repaintings, the accumulated weight of the paint itself will cause it to flake off. And once the paint starts to flake, it has to be removed. 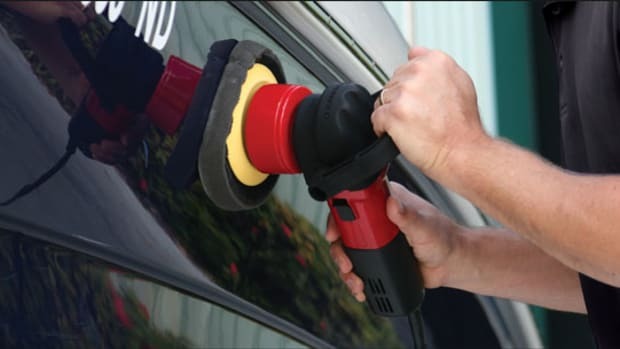 How can you tell when the paint’s getting too thick? “If there’s an actual ledge against the masking tape at the waterline, it’s time to at least sand it to take some layers off,” he said. Dolan explained that an energetic attack with 60-grit paper can coax more years from your bottom, and let you schedule the complete job on your own terms—maybe you don’t have the budget for it this year, or the job will delay launching your boat, and you’d rather do it next spring. And you might make a better deal with the boatyard if you work with them on scheduling: Glen Billings, proprietor of Billings Media Blasting (www.billingsblasting.com) in Glastonbury, Connecticut, works for boatyards throughout New England. He said that yards usually prefer the bottoms stripped in the fall, so they can prep and recoat as weather permits over the winter, when work is scarce. Boat owners tend to wait until spring, when everybody’s busy. Note that every paint manufacturer recommends sanding before recoating to remove some of the dead paint and improve adhesion of the new coat. It’s a directive that’s overlooked as often as it is followed, but it will earn you more years out of your bottom. 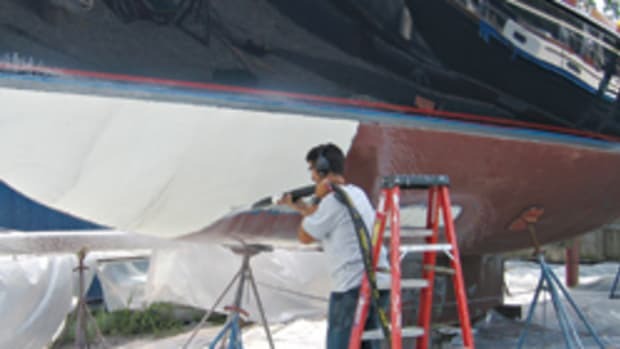 Boatyards don’t like sanding because it takes time, and bottom painting is priced per foot, not per hour; sanding isn’t rough only on paint, but on profits, too. And the paint sticks fine without sanding—until it doesn’t. Today, most yards insist on doing all hull work, for environmental, liability, and economic reasons, but if you can find a yard that lets you do your own work, use your own free labor to prep your bottom properly. Then pay the yard to paint it; they have to make a living, too. 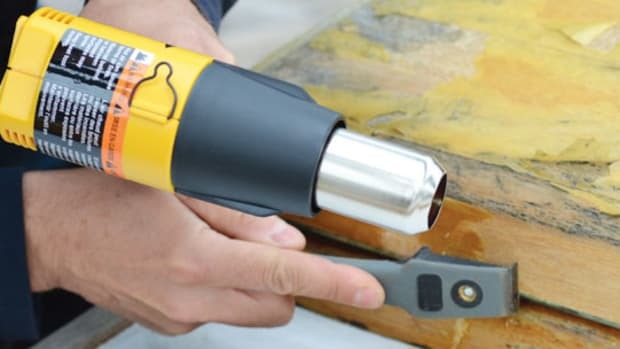 If you insist on doing a strip job yourself, your options are mechanical (scraping and sanding) or chemical, using a liquid stripper like Interlux Interstrip 299E, Soy Strip (www.franmar.com), or a paste/paper product like Peel Away Marine Strip (dumondchemicals.com). Dry scraping is torture, chemical stripping is messy, and if you have many layers of paint on the bottom you’ll probably have to apply peel products a few times. Whichever method you choose, wear eye protection, and a pro-quality combination respirator that filters both dust and fumes—don’t rely on a cheap paper mask. Once the paint is off, you’ll be using solvents to clean and prep the bottom, and you’ll appreciate the respirator. 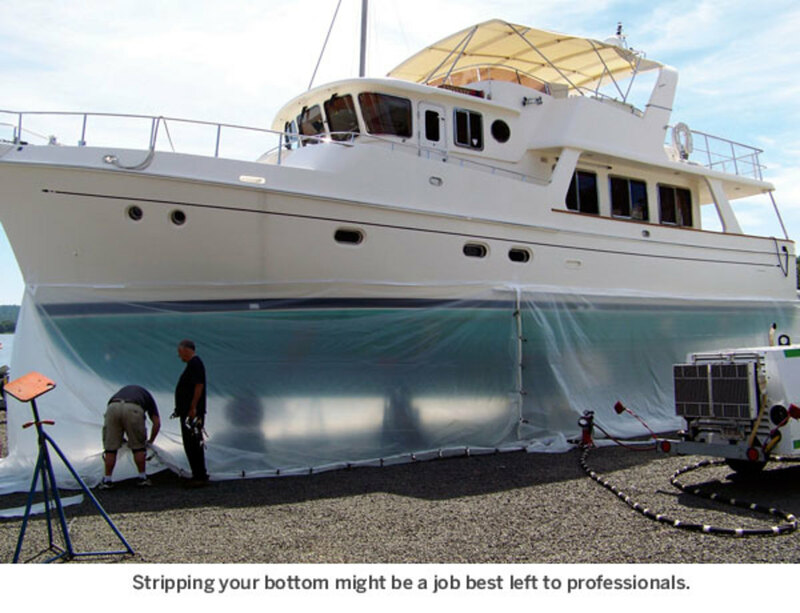 For my money, blasting is the fastest, most efficient, and most economical way to remove antifouling paint. 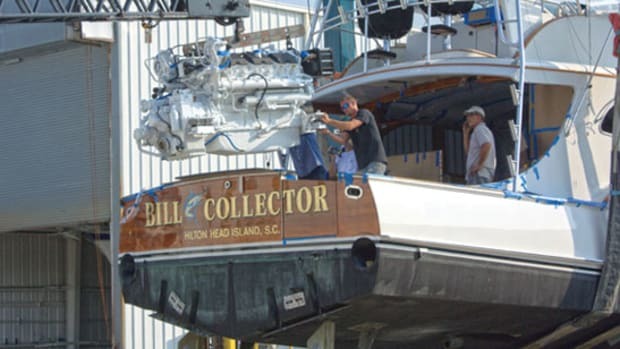 A pro like Billings can strip your boat in a day. He uses crushed walnut shells to remove the soft antifouling without damaging the harder gelcoat or barrier coat underneath. The walnut shells will sometimes open blisters, but if boat pox is an issue, Billings will use sand instead to open them up. 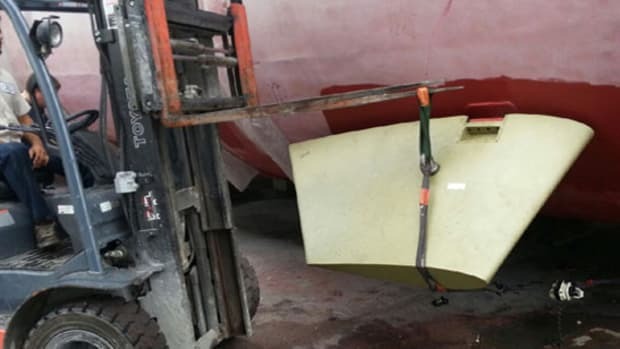 When the blasting is done, there should be just a tinge of color left on the hull, he said, the result of the first coat of antifouling being “done properly”—laid over primed gelcoat or a tacky barrier coat to form a strong chemical bond. If you end up with nice clean gelcoat, the paint wasn’t applied correctly in the first place. Some professionals “dry blast” with just air pressure as a propellant, while others “slurry blast” with water to keep the dust down. Billings prefers dry blasting because it makes clean-up easier: He tents the bottom to corral the dust and spent abrasive, and lays down plastic sheets under the boat to catch the debris; when the job is done, he simply rolls up the plastic and disposes of it. With wet blasting you have to contain the water, too, he said. “You can’t keep things clean enough.” (Proponents of wet blasting say most of the water evaporates away, and at worst you get muddy debris.) Bottom line is, it’s the blaster’s choice: As far as the job is concerned, both methods get ’er done. 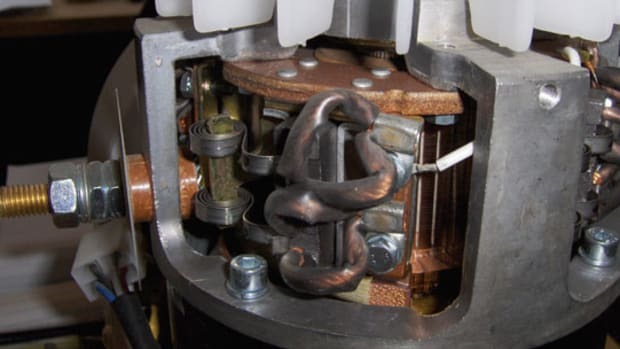 While you don’t have to become a blaster and strip your own bottom, learning a bit about it can help you find the right expert, or the right yard, to do the job. MMLJ Manufacturing has been building sandblasting equipment since 1941; their Dustless Blasting (www.dustlessblasting.com) process uses water and recycled crushed glass to strip the surface. A visit to their website will give you a quick education in blasting. Company spokesman Ryan Detablan said MMLJ will sell you a standalone dustless blaster if you’re serious about doing your own bottom stripping. Model DB800 is just right for most applications. It comes with the compressor, blaster, water tank, and all associated gear mounted on a trailer; just hook it up to your truck and drive away. Cost is about $49,500, though, so maybe you’d rather just hire a pro. On the other hand, there are a lot of bottoms out there overdue for stripping. This article originally appeared in the April 2015 issue of Power & Motoryacht magazine.